CUSTOMERS OF RETAILER House of Fraser who purchased or were issued gift cards in euros will not be able to have them reissued after the company went into administration and was taken over last year. This is despite House of Fraser saying in August that gift cards could be replaced with the full value being honoured online. As well as this, House of Fraser has committed to replacing gift that were issued in Britain in sterling to be used in online transactions, despite it refusing to honour or reissue Irish gift cards in euro. 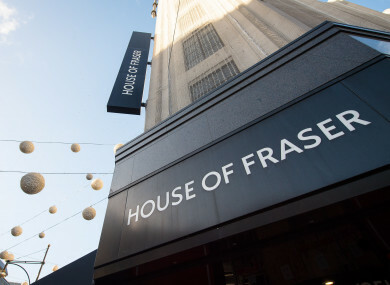 The company behind House of Fraser went into administration in August. It’s assets were then quickly snapped up by English businessman Mike Ashley’s company Sports Direct. The Dundrum store remains open, with Sports Direct formally taking it over in October, after the takeover was given the green light by the Competition and Consumer Protection Commission (CCPC). Back in August, House of Fraser in Dundrum announced that it had stopped accepting its own gift cards after it went into administration. A notice in the Dundrum store stated that “unfortunately” the retailer will no longer be accepting gift cards or vouchers as a form of payment. However, the company’s official Twitter account said in response to a query about Dundrum that gift cards and vouchers would be reissued to customers. Since then, House of Fraser has told Irish customers that it will not be honouring or reissuing gift cards or vouchers that were issued in euro. This is despite the fact that in October, the company advised customers that they would be offered an online-only voucher that could be redeemed up until 31 January. TheJournal.ie has spoken to two Irish customers who were informed by the retailer since then that it would not be honouring euro gift cards, or reissuing any online-only vouchers in exchange. Both contacted House of Fraser repeatedly by email and phone over a number of months and posted back their gift cards, as they were advised to do by the retailer. Gillian O’Rourke, from Dublin, Ireland, told TheJournal.ie that she had returned a number of items to House of Fraser, Dundrum, at the start of August last year, and was given the value of the items on a gift card. She was later refused in-store when she tried to use the gift card, which had a value of €356. “I was sickened,” O’Rourke said. She said that she contacted House of Fraser and was advised to send the gift card details to a designated address. “I did this (cost me €8) and heard nothing back,” she said. That was in September. From September [to] December I tried many times to get in touch with [House of Fraser]. I sent countless emails but nothing. She said she eventually contacted the customer care team through an online chat function, and was informed that House of Fraser was only honouring gift card issued for GBP and not euro. “I said I’d be more than willing [or] happy to take a GBP card… and was refused,” she said. “So, so disappointing. Makes me feel sick when I think about it. €356 gone down the drain. I honestly don’t understand why they won’t honour Irish customers when they’re honouring UK-based customers. It seems wrong. TheJournal.ie has seen correspondence with another customer from House of Fraser in which it says it will not be honouring or reissuing gift cards in euro. “I have looked into this for you and unfortunately we are not able to provide gift card replacements that were originally in euros. We want to take the opportunity to explain the position,” a customer care rep said in an email to the customer last December. “As you may know, on 10 August 2018 Sports Direct acquired the business and assets of House of Fraser. As a result of this transaction Sports Direct had no liability to any customers in possession of gift cards and vouchers with an active balance issued prior to that date. Similar to O’Rourke, the customer had attempted to contact the retailer on multiple occasions between August and December. A third customer who contacted the organisation after their gift card was refused in store, was sent an email from the administrators – EY – in charge of winding down the company. The email advised the customer that if they paid for the gift card with a credit or debit card, they may be able to apply for a refund from their bank. If not, the customer was informed that they were then “an unsecured creditor” of the company. “In this instance, as an unsecured creditor of the Administration, you would be able to submit a claim form to the Administrators,” the email said. However, it said that any payment or dividend was very likely to be less that 1p in the pound and would only be paid once the company has been fully wound up. TheJournal.ie contacted House of Fraser Dundrum’s customer care team and was informed it would not be reissuing or redeeming any gift cards issued. Sports Direct and House of Fraser had not responded to requests for comment by the time of publication. The CCPC said that between 1 August and 31 December of last year it received 22 queries relating to the usage and acceptance of House of Fraser gift cards. “However, none of these queries relate specifically to House of Fraser not reissuing or replacing gift cards that were issued in Euro,” a spokesperson said. The CCPC also said that when a business changes ownership “there is no obligation on the new business owners to accept gift vouchers/cards issued by the previous business owners”. “Anything the new business owners might offer to consumers is at their own discretion,” a spokesperson said. Email “House of Fraser won't be honouring or reissuing Irish gift cards (but it is reissuing British ones)”. Feedback on “House of Fraser won't be honouring or reissuing Irish gift cards (but it is reissuing British ones)”.